A new all-you-can-eat Brazilian restaurant is the latest dining concept to open at Beverley’s Flemingate centre. Showcasing the best of Brazilian cuisine, Estábulo Rodizio Bar & Grill captures the spirit of Brazil and honours the traditional method of cooking favoured by the Gaúchos – the celebrated South American horsemen. This involves taking the most delicious and flavoursome cuts of meat, which are skewered and cooked slowly over open flames. Experienced carving waiters, called Passadors, then serve the skewers of beef, pork, lamb or chicken directly onto your plate. Estábulo Group currently operates two restaurants in Leeds and another in Wakefield. The Flemingate opening follows a high-quality refurbishment giving the 120-cover restaurant an authentic Brazilian decor and style. The 3,500 sq ft eatery also has extensive outdoor seating, allowing customers to enjoy a meal or drink with views of Beverley’s magnificent Minster. 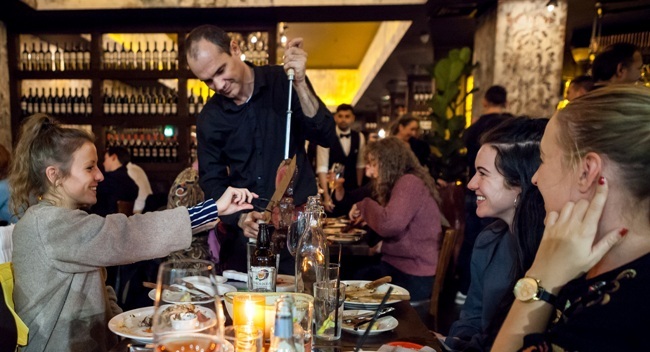 The new restaurant employs 35 staff, including Passadors from South America. Peter Roberts, operations director at Estábulo Group, said: “We’re very excited to open at Flemingate. “It’s an excellent location, with strong footfall and very close to the centre of Beverley. Flemingate has a great mix of retail and leisure uses, including a cinema, and has on-site parking, and those are all very positive factors behind our decision to choose this site for our latest restaurant. “Estábulo is a real dining destination. Our brand is all about friends and family getting together and enjoying a feast, socialising and sharing stories, in the traditional way of a Brazilian rodizio. Diners can eat as much or as little as they like from a large selection of meats on offer, including the flavoursome Picanha (cap of rump); tender Carneiro (seasoned lamb); succulent Barriga de Porco (pork belly smothered in honey); and the delicious Brazilian delicacy Coracao de Frango (chicken heart). If 15 types of mouth-watering meat isn’t enough, there is also a gourmet salad bar, traditional Brazilian hot dishes, choice of vegetables, array of breads and a selection of cured meats and cheeses. In addition to the main menu, Estábulo also offers a range of vegetarian, vegan and halal dishes, such as Spaghetti Pomodoro, Penne Arrabbiata and a seasonal fish dish. An extensive cocktail, drinks and wine menu complements the dining options. Graham Tait, Flemingate Centre manager, said: “We’re delighted to welcome Estábulo to Flemingate. “Rodizio-style dining is becoming very popular and the theatrical way of serving the food makes it a really entertaining and lively experience. “Estábulo’s existing restaurants are high-quality establishments offering fabulous food and service and they are committed to matching that at Flemingate. Owned and developed by Hull-based regeneration company Wykeland Group, the Flemingate development is Beverley’s largest-ever regeneration scheme and includes big-name brands such as Debenhams and H&M as well as being home to the East Riding College campus, an 80-bed Premier Inn hotel and a six-screen digital cinema, Parkway. Flemingate is located just 300 metres east of the town centre, with excellent public transport links from nearby towns and cities and good road links with York, Hull and Leeds. The development is just a two-minute walk from Beverley Railway Station. Estábulo adds further variety and choice to Flemingate’s high-quality line-up of restaurants and cafés, including Gourmet Burger Kitchen, Buca di Pizza, Firepit Smokehouse and Sports Bar, Deli No.1, Patisserie Valerie, Starbucks and Costa Coffee.